Agents using ShowingTime for the MLS have many options available to be informed immediately of showing requests, confirmed appointments and cancelled appointments. Calls marked to be handled by ShowingVoice are made instantly, as are Email, Text Message, or Push Notifications. Email (Electronic Mail) is used as a base for most communications. Text Message, also known as SMS (Short Messaging Service). 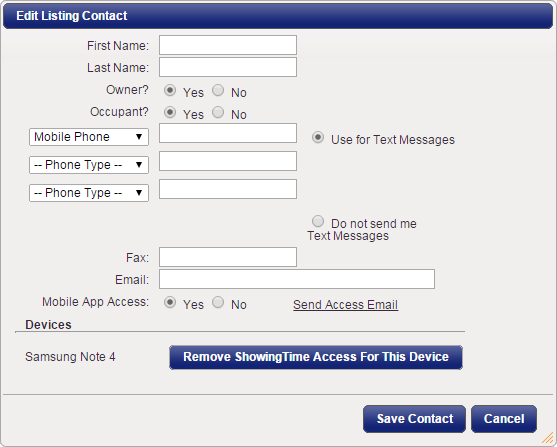 ShowingTime for the MLS customers has two SMS methods available, as determined by their MLS. In both instances, notifications of an appointment's status are sent instantly. 1-way SMS - These messages will only be used to inform you of an appointment's status. 2-way SMS ** - These messages can be replied to with either a 'Y' to confirm a showing, or 'N' to decline a showing. When you enable Push Notifications, you'll see showing requests, appointment statuses and other messages related to showings or feedback in the top navigation bar of your smartphone so you are always up to date. This section allows you to configure each contact's notification preferences when appointments are scheduled so they can quickly confirm requests. These options will only be presented when the Appointment Required appointment type is selected. This section allows you to configure any contact's notification preferences when appointments have been confirmed or cancelled. A quick explanation of how contacts will be handled with the current configuration. Advanced Notifications are designed to alert selected listing contacts when an appointment request is in danger of being missed, declined, or cancelled. With this option, you can add a Co-Listing Agent to your listing (only agents from the same office can be added). Used to delete the contact from the listing. Used to edit a contact's details. See the Editing Contacts section below. ShowingVoice calls contacts in the order their phone numbers are listed on this form. Text Messaging options will only appear when a contact's phone type has been set to "Mobile Phone". Mobile App access can only be provided to sellers or tenants if a valid email address is on file so the authentication process can be initiated. Once the seller or tenant has been authenticated (they'll get an email with authentication links), their devices will appear under the Devices section. Sellers & tenants are not restricted as to the number of devices that can be authenticated. If there are multiple contacts for a listing, it is recommended that each contact is listed separately. 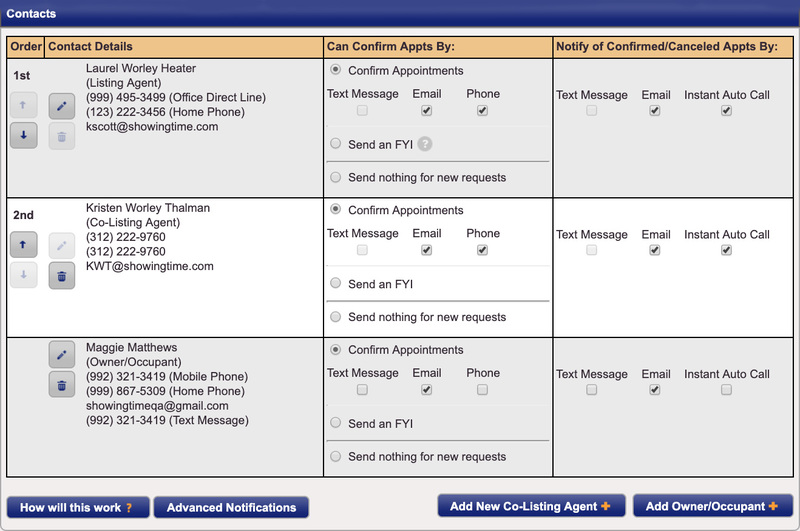 Then, activity logs for each contact will list actions taken to confirm, cancel or decline appointments. To revoke access to a specific device, click on the Remove ShowingTime Access For This Device button. ** Certain features shown are determined by your MLS and may not be available in all markets.